Buses on Route 3 run from Hamilton to the historic town of St George. It’s similar to Route 1, but travels along Middle Road rather than the South Road. After leaving the bus station in Hamilton, the bus makes it way down Cavendish Road and on to Middle Road. The first point of interest on Middle Road is the Arboretum, a beautiful park with a fantastic collection of trees and shrubs from all over the globe. The US Consulate is just across the road. Continuing along Middle Road, the bus passes the Ocean View Golf Course and enters picturesque Flatts Village. Here you’ll find the Bermuda Aquarium (BAMZ), and places to eat like Rustico and Four Star Pizza. After leaving Flatts the bus travels around Harrington Sound passing the Rosewood Tucker’s Point hotel and the Crystal Caves. It then passes through Bailey’s Bay, a small neighbourhood on the eastern shore of Castle Harbour home to the Swizzle Inn, Grotto Bay Beach Resort, and Blue Hole Park. The bus then crosses the Causeway, a half-mile long bridge linking the main Bermuda Island to St David’s Island and St George’s Parish. It calls at LF Wade International Airport and shortly after arrives in the town of St George. There are plenty of things to see in St George. Attractions include the Bermuda Perfumery, the Unfinished Church, the Bermuda National Trust Museum, and the Deliverance. If you want something to eat or drink try the White Horse or Wahoo’s. Bus 3 runs every 30 minutes or so with services starting from Hamilton at 7.15 am. The total journey time from Hamilton to St George is around 1 hour. 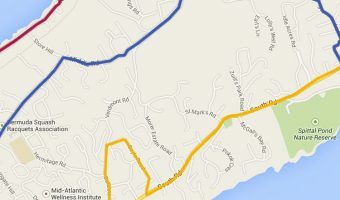 Passengers should note that some buses on Route 3 only go as far as the Grotto Bay Beach Resort. Check the official timetable for details. The travel times from Hamilton to selected points of interest on this bus route are shown below.